The Colony Theatre in Burbank has announced its 2010 – 2011 season which includes four plays and the red hot musical The All Night Strut! Opening the season is Grace and Glorie by Tom Ziegler June 9 – July 18, 2010. Grace is a feisty illiterate 90-year-old who has checked herself out of the hospital and returned to her ramshackle cottage in the mountains of Virginia. Enter Gloria, a transplanted New Yorker with a Harvard MBA, now volunteering as a hospice caregiver. At first, cultures and generations hilariously collide, but over time they realize they have more in common than they ever could have imagined. Following Grace and Glorie is the west coast premiere of Free Man of Color by Charles Smith, August 11 – September 12, 2010. This stirring drama about one of the first freed slaves to graduate from an American university is based on a true story. It explores the life of John Newton Templeton, a fascinating but forgotten figure in our history who learns that with freedom comes great responsibility, and that his future is not as obvious as the color of his skin. Next, Richard Israel will direct Bell, Book and Candle by John van Druten, October 20 – November 21, 2010. Gillian is a beautiful witch living in 1950s New York City who is smitten with her handsome upstairs neighbor. She casts a little spell, and he is immediately and completely captivated by her. But Gillian must be careful - if she falls in love with him, she could lose her magical powers forever. A frothy and spellbinding romantic comedy, Bell, Book and Candle shows that love might be the most bewitching spell of all. The new year begins with the wildly funny Moonlight and Magnolias by Ron Hutchinson, February 2 – March 6, 2011. It is Hollywood 1939. Famed producer David O. Selznick is three weeks into filming his latest historical epic, Gone With The Wind, but the screenplay just isn't working. He hires script doctor Ben Hecht to rewrite the script in five days…but Hecht has never read the book. So, Selznick pulls director Victor Fleming from The Wizard of Oz and with Hecht, the three men spend five days locked in the producer's office re-enacting Margaret Mitchell's bestseller to craft a screenplay that will become one of the most successful films of all time. Inspired by true events, Moonlight and Magnolias illuminates the behind-the-scenes business of movie-making, and the larger-than-life egos, during the golden age of Hollywood. 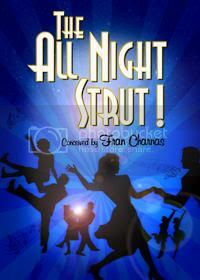 The Colony’s season will close with the musical The All Night Strut! March 30 to May 1, 2011. Conceived by Fran Charnas, this classy, sassy musical celebration carries us through the Depression, World War II, and the postwar boom. From the funky jive of Harlem to the sophisticated elegance of El Morocco and the romance of the Stage Door Canteen, this international hit sings, soars, and struts with its sublime, timeless music and sheer energy with songs that tug the heart, tickle the funny bone, and raise the rafters. Songs include In The Mood, Fascinating Rhythm, Chattanooga Choo Choo, Ain’t Misbehavin’, and more, by such legendary composers as Hoagy Carmichael, Frank Loesser, Duke Ellington, Johnny Mercer, Jerome Kern, Cab Calloway, and George Gershwin. The Colony Theatre is located at 555 North Third Street, Burbank, CA 91502. More information and tickets are available by calling the box office at 818-558-7000 or you can go to www.colonytheatre.org/shop/subscribe.php.